Canadapharmacyonline.com just like its name suggests is Canadian pharmacy that operates on the web. The drugstore has been selling medications online since the year 2006. In the span of only 12 years, the drugstore states that it has managed to gain more than half a million customers. The drugstore offers both prescription and non-prescriptions. After a careful scrutinization of the pharmacy, I could not find a controlled medication. What I found are medications which have been approved by the FDA. One medication that stood out in the men’s health section is Cialis. This medication is used in the treatment of erectile dysfunction. 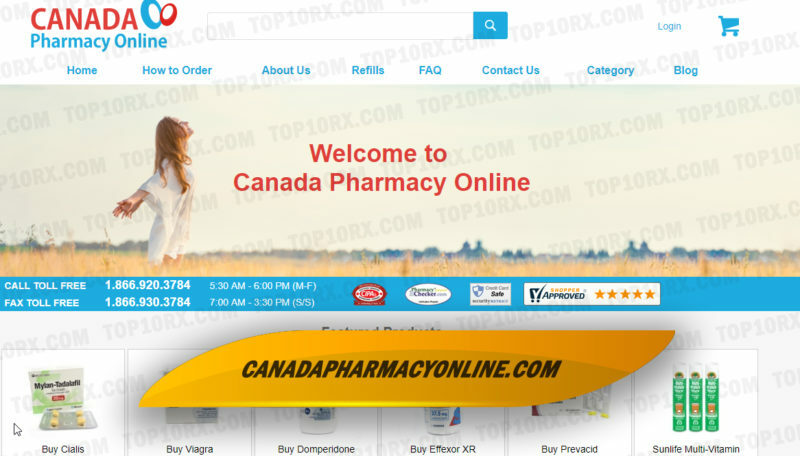 Canada Pharmacy Online had both the generic and brand versions of the medication. The brand Cialis is worth at least $14.53. A pill of generic Cialis will cost you $3.28. To pay for your meds at Canada Pharmacy Online, you will need to have your credit card ready. If you don’t have a credit card, you can use international money orders or a personal check. The accepted credit cards include Mastercard and VISA. Canadapharmacyonline.com was not very clear on the methods of shipping they will use to deliver your medications. What the drugstore was clear about is the shipping cost. The pharmacy charges a flat shipping rate of $10 for people who live in USA, Canada, UK, and Australia. Everyone from any other country will have to pay $25. The average delivery time for all medications is between 10 to 18 days. The shipping time may vary depending on where you are located. If you receive your package and notice that the product is not as satisfactory as you would want it to be, you can send it back. You will have to contact the pharmacy within 14 days since the time you received your product to learn how the product can be returned. The pharmacy will offer you a full refund. If the package has already been opened, you will get a 50% refund. If you don’t receive your products after a period of 30 days, Canadapharmacyonline.com promises to reship your package for free. The first reviewer has rated the drugstore 4 stars. Lawrence says that ordering was extremely easy. Also, he found the price to be better when compared to the domestic price. What he is not happy about is the fact that he has to sign for the package. Michelle reports that she is happy with the service she has received. She says that she will continue using the drugstore. She has even referred other friends. It is important to note that she has also rated Canada Pharmacy Online 4 stars. 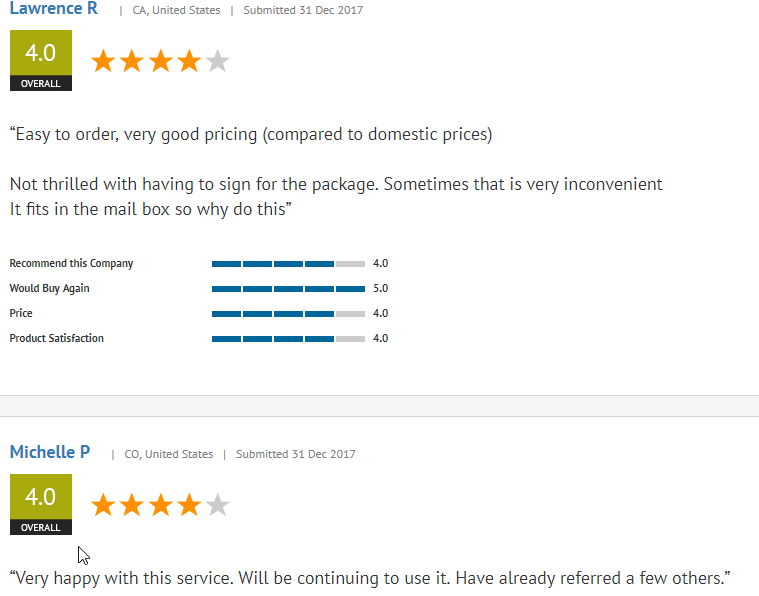 The fact that the two reviewers whose reviews I have captured above have not rated Canadapharmacyonline.com 5 stars means that there is something bothering them about the pharmacy. 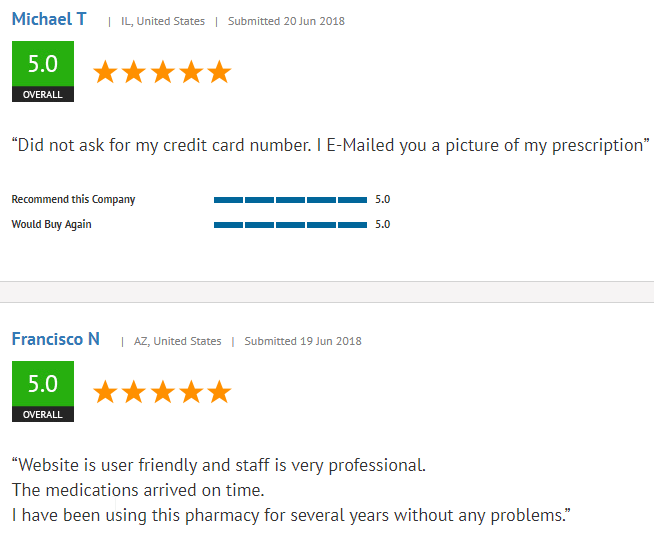 I recommend locating an online pharmacy that has gotten a perfect rating from its previous customers. This will guarantee you that the pharmacy you are dealing with is perfect. Michael T reports that the drugstore did not ask for his credit card number. All he needed to do was send the pharmacy a picture of his prescription. Francisco reports that Canadapharmacyonline.com website is user-friendly and the staff is very professional. His medications arrived on time. He has been using the pharmacy for several years now and he has not experienced any problems. I tried looking everywhere online for promo codes which I could use at Canadapharmacyonline.com but I could not locate any coupon codes. This actually looked strange to me. 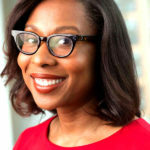 A pharmacy that has a large number of customers is supposed to at least offer the customers a way to save money through the use of coupon and promo codes. I am sure many customers would prefer using a pharmacy that has some promo codes so that they can at least use them to get a discount. This is one major reason why I would not recommend using this pharmacy to buy your medication.